You have probably seen the following chart numerous times if you spend time reading about the financial markets and stocks. 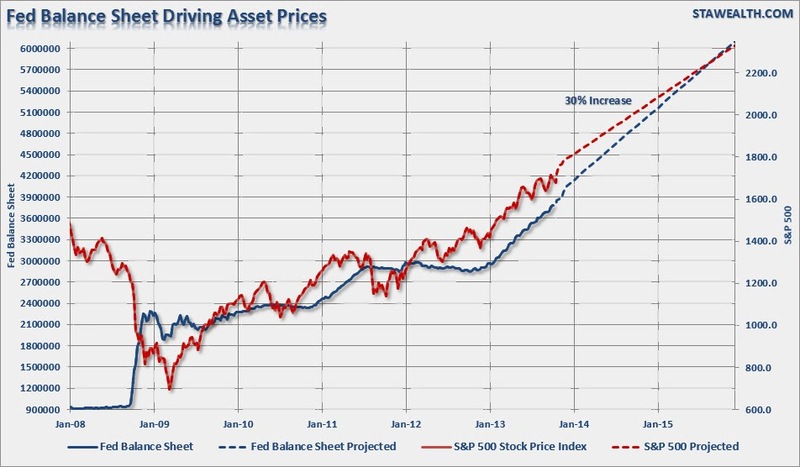 The chart implies that quantitative easing has put a floor under stocks and the asset buying program will continue to lift stocks years into the future. Writers now go as far as to say that as long as the QE program continues that stocks will simply move higher with the Fed's invisible hand. If they sell bonds into the market, then stocks will then fall in line (smoothly) with the Fed's reduced balance sheet. As a side note, the Fed will be never be able to actually sell assets into the market and "exit" the QE program. To understand why see: Why The Fed Can Never Exit. This same type of chart was used over and over during the first 13 years of gold's rise. It showed that the increase in the debt ceiling was directly correlated with an increase in the price of gold. As long as the debt ceiling kept rising (which it always will) it would keep a permanent floor under the gold price. That changed this year, when gold entered into its largest cyclical correction during its secular bull market. Now the chart is no longer used and has been forgotten. 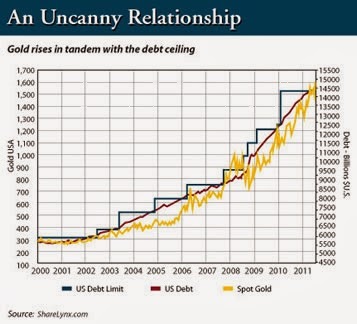 Is there a fundamental correlation between gold and the debt ceiling? Is there a fundamental correlation between stocks and the Fed's balance sheet? Of course. But to try and say there is now some sort of "floor" under stocks because the Fed is magically holding them higher is an extremely dangerous thought process. I expect stocks to fall at some point during 2014 even as the balance sheet grows. Before this insane process is over, the world will see that central banks have far less power than the gods they are believed to be today.